Vietnamese nationalist leader Ho Chi Minh proclaimed independent Vietnam after the defeat of Japanese. French forces returned to Vietnam to re-establish their control of the region. Viet Minh forces (led by Ho Chi Minh) began 8-year Indochina war to remove French from Vietnam. Truman announced massive U.S. military aid to French in Indochina. French army suffered major defeat by Viet Minh at Dien Bien Phu. At the peace talks that followed, Vietnam was divided into (Communist) North Vietnam under Ho Chi Minh and (non-Communist) South Vietnam. 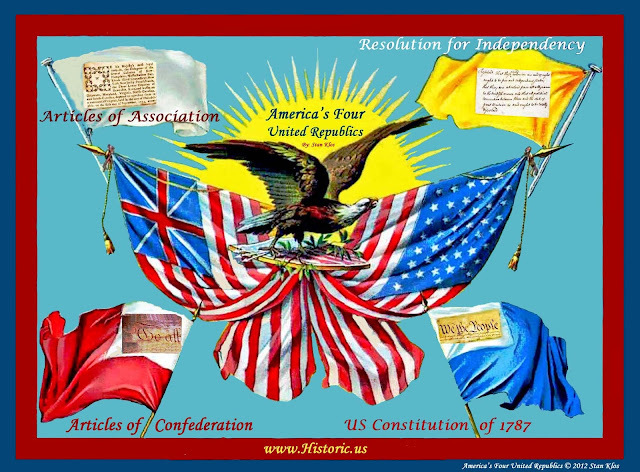 SEATO Alliance founded - Australia, Britain, France, Pakistan, the Philippines, Thailand, New Zealand, and the United States form an anti-communist alliance against "massive military aggression." Kennedy authorized American military advisers to aid South Vietnam, against the forces of North Vietnam. President Kennedy ordered 5000 US troops to border of Thailand to counter Communist attacks in Laos and movement toward the Thailand border. South Vietnamese President Ngo Dinh Diem assassinated. US warships attacked in Gulf of Tonkin by North Vietnamese patrol boats. US Congress approved Gulf of Tonkin Resolution giving President Johnson power to take "all necessary measures to repel any armed attack against the forces of the United States, and to prevent further aggression." Lyndon B. Johnson re-elected President. U.S. Marines landed at Da Nang - first official combat troops in Vietnam. Battle of the Ia Drang Valley, the first major clash between the United States and North Vietnamese Army. Vietnam: U.S. forces in Vietnam number 184,300. 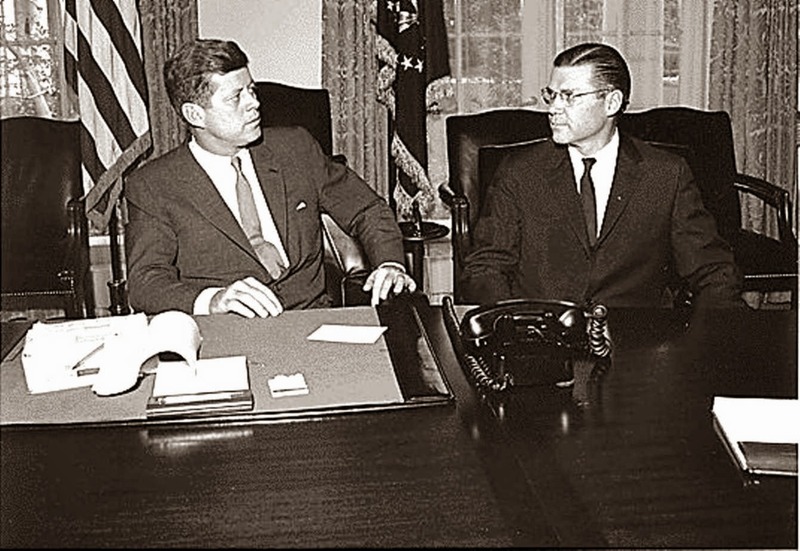 US Senate began hearings on the Vietnam War chaired by Senator Fulbright. 10,000 Buddhists march in Saigon protesting against U.S. support for corrupt South Vietnamese regime. Anti-Vietnam War rallies in seven United States and European cities. U.S. forces number 362,000 in Vietnam. Vietnam: U.S. forces number 485,000 in Vietnam. Tet Offensive, attacks on South Vietnamese cities by North Vietnamese and NLF troops. My Lai massacre in Vietnam. Johnson announced he would not stand for President again, mainly because of the Vietnam War. Vietnam: U.S. forces number 535,000 in Vietnam. United States began bombing of Cambodia. Nixon Doctrine and "Vietnamization" begins. Nixon orders first troops out of Vietnam. U.S. forces number 475,200. Nixon Doctrine: Nixon reaffirmed U.S. commitment to defend its allies, but called on developing nations to take the lead role to defend themselves. Death of Ho Chi Minh. March on Washington draws record 250,000 anti-war protesters. Paris Peace Talks begin between Kissinger and Vietnamese negotiator Le Duc Tho. Four Kent State University students killed by National Guardsmen while protesting against Vietnam War. Vietnam: U.S. forces number 334,600 in Vietnam. Nixon visits China, pledges to withdraw U.S. forces from Taiwan. Vietnam: Nixon ordered the mining of Haiphong Harbor and intensive bombing of all military targets in North Vietnam. Nixon and Brezhnev sign agreement on the "basic principles of detente" which improved superpower relations. U.S. bombers carried out largest 24-hour bombing of the Vietnam War on North Vietnam. Paris Peace Talks break down. Nixon ordered renewed bombing of Hanoi and Haiphong, North Vietnam. Nixon announced Vietnam War will end on January 28 and troops will be removed within 60 days. Paris Accords established cease-fire and political settlement of Vietnam War. Military Assistance Command Vietnam closes, last U.S. soldiers leave. U.S. bombing of Cambodia ends. United States ends official presence in Cambodia as Marines evacuate diplomats in wake of Khmer Rouge victory. Saigon falls to North Vietnamese troops as Americans evacuate. Long before the first 35 American military advisors ever-stepped foot onto the soil of Southeast Asian and long before the construction of the first Special Forces out -post, erance had already colonized the easternmost region of the Indochina peninsula. In the early part of the 19th century the race was on for establishing a Colonial Empire. The French quickly seized Cochin China as a colony and in 1863 became the protective force of Cambodia, followed by Annam and Tonkin in 1884. These four states were to be unionized into Indochina in 1887 with Laos completing the union in 1893. During World War II the French were forced to allow the Army of Japan to utilize their colonies in North Indochina, however, when the Japanese moved into South Indochina in 1941, the Americans, deeming this a threat to the Philippines, reacted by freezing all of the Japanese assets in America. Toward the end of World War II as the Japanese invaders were pulling out of French Indochina, France had announced their plans for an alliance of Indochina within the French union thereby allowing the states to form their own governments. Cambodia and Laos accepted the federation without question. However, the Vietnamese Nationalist demanded that the French grant complete independence to Annam, Cochin China and Tonkin as Vietnam. The French did agree to recognize Vietnam as a free state with in the French Union. Ho Chi Minh and his communist political party, the Vietminh, refused to accept these terms and would not answer to French authority in any form. Shortly after the negotiations failed, the Vietminh forces, aided by China, began their highly aggressive attacks against the French out posts along the Vietnam border. By 1951, the Vietminh forces had created a common front with communist groups in Laos and Kampuchea, with whom they intensified both the number of and the aggressiveness of their attacks against the French. The final days of the French Colonies were nearing when on March 13, 1954, the communist combatants under the direction of General VO Nguyen Giap attacked the French stronghold at Dienbienphu in Northwest Vietnam. For 56 straight days the Vietminh attacked the little outpost with grenades, machinegun fire and mortars until the French had depleted their ammo supply and was left with only one option...surrender. As this assault was raging and pushing the French nearer to surrender, the Geneva Conference was compiling a peace treaty that would put an end to the fighting and allow the French troops to withdraw. The result of this conference ended with the French losing control of Indochina. Not long after the French lost control of Indochina the Vietminh set about establishing a communist government North of the 17th parallel line while the non-communist Vietnamese established their government to the South of the DMZ. By the end of July 1954, Vietnam had divided itself in half, with the Democratic Republic of Vietnam in the North, and in the south, the Republic of Vietnam. Although the French withdrew this did not end the bitter hostilities and fighting that would ensue between the communist North and the Republic of South Vietnam. Although the Geneva Conference instituted the ruling that Vietnam would hold national elections in 1956, which was to both reunify the country and abolish the 17 parallel, the United States and many anticommunist were against this, feeling that this empowered Communist Vietnam by a larger margin. Because of his total distaste for the Accords offered by the Geneva Conference, Secretary of State, John Forester Dulles decided that if the north was going to seize the south it would not be without a fight. When President of South Vietnam, Ngo Dinh Diem cancelled the 1956 elections Ho Chi Minh, irate by this decision, realizing that the benefits he had hoped the north would have gained from this election, openly denounced the decision and soon after, South Vietnam became the target of Viet Cong guerilla assaults. As the Viet Cong insurgents operated with the backing of the North Vietnamese, The south was receiving advice and aid from the United States. However, President Diem's army was not able to suppress the master guerillas of Vo Nguyen Giap, who in 1960 organized the National Liberal Front. The organization of the NLF began to turn the wheels of war. soon, it would no longer be a civil war between the north and the south, but an International war that would eventually result in the deployment of over 500,000 American troops. Washington was accusing the communist of backing the series of attacks against Saigon, denouncing the NLF as being nothing more than puppets of Hanoi. When President John F. Kennedy sent investigators to Indochina in 1961 to assess the condition of South Vietnam and to determine what other assistance would be required form the United States there was little doubt that the U.S. would need to send armed troops. The December 1961, White Papers not only urged, but demanded that in order to crush the NLF, America would have to increase not only her technical and economic assistance, but she would also need to send American advisors. Although President Kennedy did not approve the request for the deployment of ground troops he did authorize the sending of more machinery and of military advisors. This was to prove futile however, for by 1963 South Vietnam was so near collapse it was apparent that a more aggressive action would be required. Following President Kennedy's assassination in November of 1963, President Lyndon Baines Johnson was debating the issuance of a more aggressive approach in order to stabilize the south. The expansion of the U.S. involvement in South Vietnam became justified when on August 2, 1964, the Communist attacked an U.S. Navy vessel, patrolling in the Gulf of Tonkin. The Johnson Administration used the August 2nd and the alleged August 4th, 1964 attack (recent disclosures have shown that this 2nd attack may not have occurred at all) to secure the Congressional Resolution which would give the president the powers to conduct the war. The Gulf of Tonkin Resolution passed both the House and Senate by a wide margin with only 2 representatives voting against the resolution. In the aftermath of the Tonkin incident, The U.S. retaliated through the use of limited air attacks on North Vietnam. Debates raged as to the best way to deal with the hostilities in Vietnam. Some advisors felt that the bombings should be expanded over North Vietnam while others argued that the bombings should remain selective and limited. Following the 1965 NLF attack on 2 American installations President Johnson ordered the continuous bombing of North Vietnam. As the bombing sorties continued and the United States began to deploy ground troops, North Vietnam had to rethink their strategy. Because the Communist North believed that the Americans had lacked any defined strategy, they had decided to employ tactics, which would make the war impossible for the Americans to win and to create unfavorable conditions for a political victory. By 1968 the situation had gone from worse to critical after the communist had launched coordinated attacks against major southern cities. The Tet Offensive so disgraced President Lyndon Johnson that in January of 1968 he announced that he would not seek re-election as President. In the Spring of 1968, President Johnson held secret peace negotiations in France in hopes of ending The U.S. involvement in Southeast Asia and to put an end to this highly aggressive and costly war. This did little to redeem the prior actions and decisions of the Democratic Party and in November of 1968, Republican Richard M. Nixon was elected as our 37th president. Nixon's Vietnamization program was successful in that it allowed the U.S. ground troops to be pulled from the jungles of Vietnam while increasing the air sorties over North Vietnam. This also turned the bulk of the ground fighting over to the ARVN (Army of the Republic of Vietnam). Despite the expansion of the war into Laos and Cambodia the Communist party refused to accept any terms of a treaty other than those, which they had imposed. The debates and the peace talks over ending the Vietnam War met with constant resistance, rejection and stalemates until early January 1973, when the Nixon administration was finally able to convince the Thieu -Ku regime that the U.S. would not abandon the South Vietnamese if they were to sign onto the peace accord. Likewise, Hanoi convinced the leaders of the NLF that all of the political prisoners being held in the south would be released following their signing of the agreement. Finally, on January 27, 1973 a peace agreement had been reached and agreed to by the United States, North Vietnam, South Vietnam and the NLF revolutionary government. With the hostilities ended, America began to withdraw her troops from the jungles of Southeast Asia. However, this agreement did not end the aggression of North Vietnam against the south. In early 1975, North Vietnam launched a full- scale attack against South Vietnam. Their cry went out for U.S. intervention but the U.S. denied their request and soon panic erupted as the advancing Communist troops marched into Saigon on April 30 1975 and seized the presidential palace. In July of 1976, Vietnam was reunified and Saigon became Ho Chi Minh City. The fighting which took place in the jungles of Vietnam had been new to the American combat troops. The guerilla tactics, the hit and run assaults and the ability to determine who was and who was not the enemy created a brand new fighting experience and with this a high causality rate. From the United States entry into the Vietnam war in 1961 to its withdraw in 1972, the United States military experienced a death toll of more than 50,000 troops. The estimated South Vietnamese death toll totaled more than 400,000 troops, the Viet Cong and North Vietnamese combined total was over 900,000 Kia's. The Vietnam War [A 2] was a Cold War military conflict that occurred in Vietnam, Laos, and Cambodia from November 1, 1955[A 1], to April 30, 1975 when Saigon fell. This war followed the First Indochina War and was fought between North Vietnam, supported by its communist allies, and the government of South Vietnam, supported by the United States and other anti-communist nations. The Viet Cong, a lightly-armed South Vietnamese communist-controlled common front, largely fought a guerrilla war against anti-communist forces in the region. The North Vietnamese Army engaged in a more conventional war, at times committing large units into battle. U.S. and South Vietnamese forces relied on air superiority and overwhelming firepower to conduct search and destroy operations, involving ground forces, artillery and airstrikes. The United States government viewed involvement in the war as a way to prevent a communist takeover of South Vietnam and part of their wider strategy of containment. The North Vietnamese government viewed the war as a colonial war, fought initially against France, backed by the United States, and later against South Vietnam, which it regarded as a US puppet state.United States military advisors arrived beginning in 1950. U.S. involvement escalated in the early 1960s, with U.S. troop levels tripling in 1961 and tripling again in 1962. U.S. combat units were deployed beginning in 1965. Operations spanned borders, with Laos and Cambodia heavily bombed. Involvement peaked in 1968 at the time of the Tet Offensive. After this, U.S. ground forces were withdrawn as part of a policy called Vietnamization. Despite the Paris Peace Accords, signed by all parties in January 1973, fighting continued. 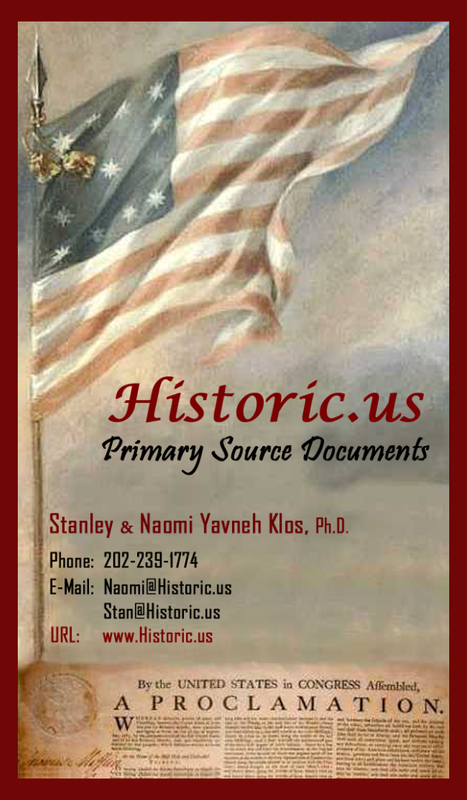 The Case-Church Amendment passed by the U.S. Congress prohibited use of American military after August 15, 1973, unless the president secured congressional approval in advance.The capture of Saigon by the North Vietnamese army in April 1975 marked the end of the Vietnam War. 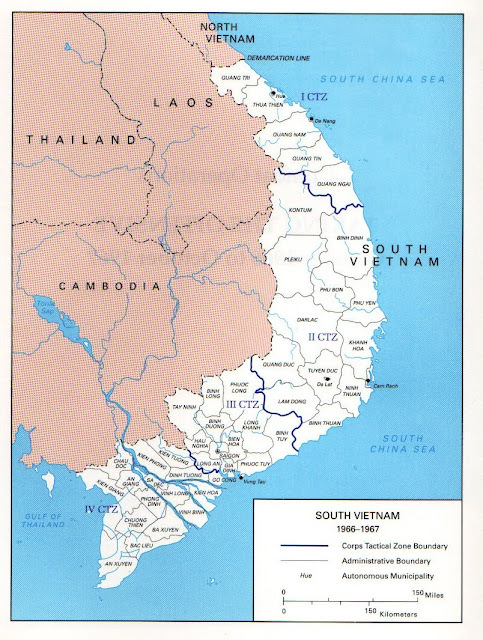 North and South Vietnam were reunified the following year. The war exacted a huge human cost in terms of fatalities (See: Vietnam War casualties), including 3 to 4 million Vietnamese from both sides, between 1.5 to 2 million Laotians and Cambodians, and 58,159 U.S. soldiers. In 1995, the Vietnamese government reported that its military forces, including the NLF, suffered 1.1 million dead and 600,000 wounded during Hanoi's conflict with the United States. Civilian deaths were put at two million in the North and South, and economic reparations were expected. Hanoi concealed the figures during the war to avoid demoralizing the population. Estimates of civilian deaths caused by American bombing in Operation Rolling Thunder range from 52,000 to 182,000. The U.S. military has estimated that between 200,000 and 250,000 South Vietnamese soldiers died in the war. Early in the American military effort it was decided that since the enemy were hiding their activities under triple-canopy jungle, a useful first step might be to defoliate certain areas. This was especially true of growth surrounding bases (both large and small) in what became known as Operation Ranch Hand. Corporations like Dow Chemical and Monsanto Company were given the task of developing herbicides for this purpose. n 1961 and 1962, the Kennedy administration authorized the use of chemicals to destroy rice crops. Between 1961 and 1967, the U.S. Air Force sprayed 20 million U.S. gallons (75,700,000 L) of concentrated herbicides over 6 million acres (24,000 km2) of crops and trees, affecting an estimated 13% of South Vietnam's land. In 1965, 42% of all herbicide was sprayed over food crops. Another purpose of herbicide use was to drive civilian populations into RVN-controlled areas. The U.S. Veterans Administration has listed prostate cancer, respiratory cancers, multiple myeloma, type II diabetes, B-cell lymphomas, soft tissue sarcoma, chloracne, porphyria cutanea tarda, peripheral neuropathy, and spina bifida in children of veterans exposed to Agent Orange. Although there has been much discussion over whether the use of these defoliants constituted a violation of the laws of war, the defoliants were not considered weapons, since exposure to them did not lead to immediate death or incapacitation. Unification of North and South Vietnam under North Vietnamese rule.